From body parts to aircraft wings, barely a week goes by without hearing that something new has been made on a 3D printer, but this might be one of the most ambitious projects yet. Detailed in a Reddit post by the London-based team behind it, the Pi-Top is a full-sized 3D printed laptop that houses a Raspberry Pi micro computer in the case. It comes complete with an integrated trackpad, ports and 13.3-inch TFT LCD monitor (1366 x 768). The prototype model was printed in three separate parts using a Rostock Max V2 printer with a PLA 1.75mm nozzle at a speed of 70mm per second, a process that took around 160 hours. An achievement in itself, the Pi-Top team's ultimate aim is to see you replicate its feat by 3D printing your own components or using one of its pre-assembled kit, which are heading to Kickstarter soon - and a hefty chunk of spare time. As such, the Pi-Top is being pitched as both an affordable computer (pledges are yet to be confirmed) and a way of learning how to 3D print, design printed circuit boards and create products from start to finish. 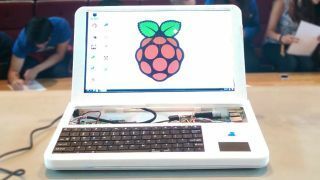 The team plans to offer free hardware lessons through its website post-launch, should it achieve its funding goal, which will include ways of how to program using the lastest Raspbian OS. Why is Slice a Raspberry Pi media player with a difference?